With a relationship or link that is connected to an existing relationship element, the number of results can be restricted using filters. The values from the target and starting data fields, which you defined here, will be compared to see if they are the same. 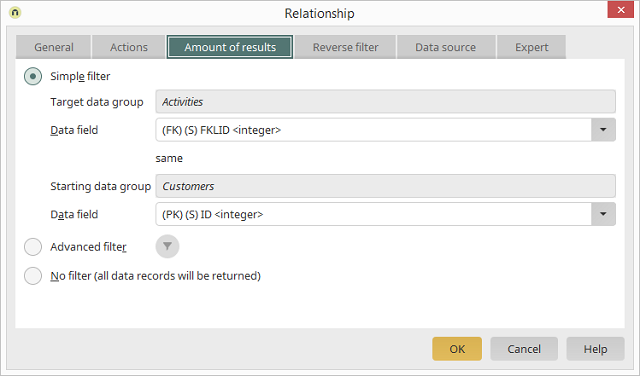 With the simple filter, the connection with the data group of the previous element will be automatically created for most cases (but not with combined primary keys, for example), when a relationship is newly created and a subordinate data group is selected from the same application. In this case, Intrexx will enter the correct key (ID of the start data group and the Foreign key of the target data group) to the Data field drop-down lists. If you want to create a relationship with an application and data group that is not subordinate to the previous data group, you must define the data fields yourself that are to be created through the relationship. Here, only data fields of the same data type can be selected. The values of these fields will be checked by a simple filter to see if they correspond. Only the data records of the target data group that have the same value in both specified fields will be output. Select the data group and data field from the target. Select the data group and data field from the source. A custom filter can be defined here. With this option, every data record from the target data group will be output without restriction.